Robinson doesn't lack confidence in his team, and certainly not in himself. He'd tried to claim pre-match that his side were better than us in the clash at the Turf earlier in the season and incredibly, after this mauling, he said: "We didn't see that coming at half time and I think we probably edged it in the first half." He went on to say: "Once the third went in the players almost looked like they were punch drunk." Reviewing the game, he said: "I don't we lacked effort and it's important that we use this night in a positive way and we have to because we're all disappointed but what do you want me to do? Dwell on it? I will use it as a driver and motivation. "The players are embarrassed and rightly so and it's how you respond to these evenings which determine how you are as a man. We looked flat in the warm up and when that second goal went in everyone just looked around and went 'oh'. "When you get beaten in that matter you open yourselves up for criticism and I don't think I've ever had a result like that in a league game, but you don't always play against a team like Burnley who got relegated from the Premier League before. "We're a million miles away from these teams but we've competed and the goals really knocked the wind out of our sails. I said to the players to let it hurt them as much as they possibly can. "We have to use this and we need everybody to stick behind us and Chelsea (their FA Cup opponents should they beat Northampton in a replay) can take a run and a jump for all I care at the moment. It's easy when you are top of the league and in cup competitions." He got some stick from someone in the crowd (if it could be called a crowd) when he took off Rob Hall and Nicky Maynard. Of that he said: "Someone had a go at me behind for doing that and at 4-0 I said to my staff that we either try and score four goals in the last 15 minutes when we've been nowhere near it for 70-odd minutes or bring them off. I think it was important to give Jake (Forster-Caskey) some minutes as well. "The scoreline tonight was a little harsh but it's football and that's the reality of the league we're in. I'll look forward to us having a conversation with the players and it's a big time for us." 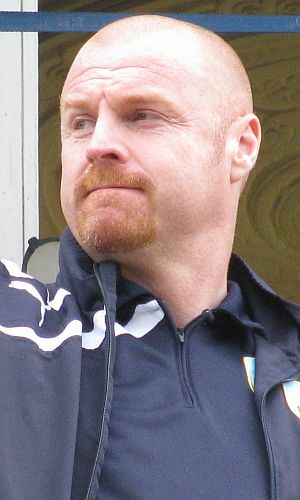 Just before Christmas we scored four in a game under Sean Dyche for the first time. We've repeated that since and now scored a five for him. He said: "The madness of football is that we had a little bumpy spell where people were saying we hadn't scored many goals, but that's a 4-0, 4-0 and 5-0 in the last five games and ten points from five games, with a good FA Cup win in there too. "Things change very quickly, but we believe in what we do and I thought it was on show again tonight. It was a very good night and I was delighted with the performance. "In the first half we were steady away but we didn't really get to the heights we want to perform at as a team. I had a word at half time, with some harshness to it, saying we had to raise our tempo and that was obviously on show. "We started with a fantastic solo goal from Sam and, after that, never really stopped." He added: "They are no mugs down here, so we knew we had to come down here and perform properly. I reminded them of that at half time. They hadn't created too many chances towards half time, but they had got a feel of the game and I thought 'that's not what we're about'. "In the second half we were very good and I was really pleased because we never gave them a breather then. That second goal can sometimes bring about a weird freedom to the side that's losing because they've nothing to lose, but we managed the game really well and ran out comfortable winners."